Circulating coin production totals from the United States Mint were sharply higher in January 2012 as compared to the previous month and from the same time period of a year ago — despite plummeting mintages of Presidential $1 coins and Native American $1 coins. A scant 1.68 million Presidential $1 coins were minted last month compared to the 72.66 million in January 2011. Likewise, 840,000 Native American $1 coins were struck versus the 6.3 million from a year ago. The drastic reduction is the result of a policy change by the Obama administration which stopped circulating production of dollar coins and permits the U.S. Mint to strike them only in quantities needed to fulfill collector demand. As such, the amount of dollars produced this year is unclear and will be for some time until a baseline is determined based on how many $1 coin bags and rolls are ordered by collectors. Going forward, mintages should become somewhat predictable much like the Kennedy half dollars. The Kennedy’s have not been produced for circulation since 2001 but have been minted for hobbyists. Their coin production total hit 3.5 million in January. That was up 50,000 from their entire 2011 output and matches the amount manufactured in 2010. January’s circulating coin production total came to 802.50 million. That was up 85.9% from December — a generally always-weak production month, and 4.9% higher than the prior January. For reference, production figures on a monthly basis for the last last dozen months follows. The biggest gains for the month came on the back of heavier mintages of Lincoln cents and Roosevelt dimes. Jefferson nickels and quarters actually declined a bit from a year ago. Coins are produced for circulation from either the U.S. Mint facility in Denver or the one in Philadelphia. The Philadelphia Mint was much busier with its output of 486.68 million coins than the Denver Mint and its 315.82 million. This is a reversal from last year at this time when Denver was more than twice as busy. No "final" mintages have been declared for any of the 2012 Presidential $1 coins or the 2012 America the Beautiful Quarters. The current quarter total of 50.8 million is assumed to be a portion of El Yunque National Forest Quarters which were released into circulation on January 23. The Chaco Culture National Historical Park Quarter are expected to begin circulating on April 2, which means production of the El Yunque quarter could continue into March. Since there are no circulating coin requirements for the 2012 Presidential dollars, it is possible that the U.S. Mint could be producing all four at the same time. 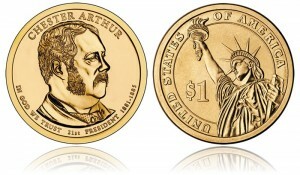 However, it is more likely that the latest Presidential $1 coin production total is only for Chester Arthur dollars. Until very recently, the Mint was expected to launch bags and rolls of the Arthur $1 coins on February 16. Their release has since been changed to a "To Be Determined" date. Still, it would seem most likely for dollar releases to occur at distinct intervals throughout 2012 and, likewise, each to have staggered production runs. The following table provides a look into the available year-to-date mintages for coins by specific design. Visit this site’s US Coins Information page for details on many of the coins listed above. Current coin production figures are based on data from the United States Mint page: http://www.usmint.gov/about_the_mint/?action=coin_production. Far too much of this country will now be denied President Arthur’s uncompromising sideburns in their pocket change. Dang it, that’s just not acceptable. We MUST pass a law TODAY forcing all Americans to buy some of these coins from the US MINT when they come out…!! No exceptions, no excuses, EVERY AMERICAN must buy it…!!! And if you don’t buy it on your own, you’ll pay a fine, and if you don’t pay the fine, they’ll take it out of your checking acct automatically…!! I have 10 books started for my grand-children. How can I get just the ten I need. Do I really have to pay 39.00 for a roll of 20 ????? Actually, I think the Arthur Dollars will be $32.95 for a roll of (25) coins. But they’re also going to offer them in 100-count bags. You can fill your sets, and spend the rest. Either way, yes, you’ll have to pay a slight premium to get them going forward. But on the plus side, they’re also going to be much more limited, more collectable, and likely more valuable in the future, making your gift all the more special. Coin shows are another good way to find them. Watch for the larger coin shows in your area, and ask the vendors if they have them. They might sell them for $1.25 or $1.50 each. • Presidential $1 Coin and First Spouse Medal set, $9.95. • American Presidency $1 Coin Cover Series, $19.95. • Presidential $1 Coin Proof set, $18.95. • Presidential $1 Coin Uncirculated set (Philadelphia Mint and Denver Mint), $16.95. • Presidential and Native American $1 Coin Rolls, $32.95. • $1 Coin 250-Coin Box, $275.95. • $1 Coin 500-Coin Box, $550.95. • $1 Coin Five-Coin set, $12.95. • $1 Coin 100-Coin Bags, $111.95. I have purchased 10 rolls of each president. I buy one roll for each grandchild. I hope to continue so each child will have all the rolls of presidential dollars. I go to Colorado from New Mexico to find the coins. I just got back after checking with the Savings and Loan company to purchase Chester Arthur coins. I was really disappointed. It was always hard to find a bank that carried the coins. How will we know when and where to buy them? I hate to let the grandchildren down. If you are looking for Presidential Dollar rolls you can go to http://www.coinsofamerica.com and purchase them fior $44.95 each. The cool thing about getting these rolls is that the 25 dollar coins come wrapped in the exclusive full color portrait series coin wraps. So simply at a glance I know what President it is and from what mint. I can choose either the P or D mint. Their # is 1-800-459-9487 and their website is http://www.coinsofamerica.com. They have the friendliest customer service reps that are knowledgeable also. I have purchased several items from them and have never been disappointed! !